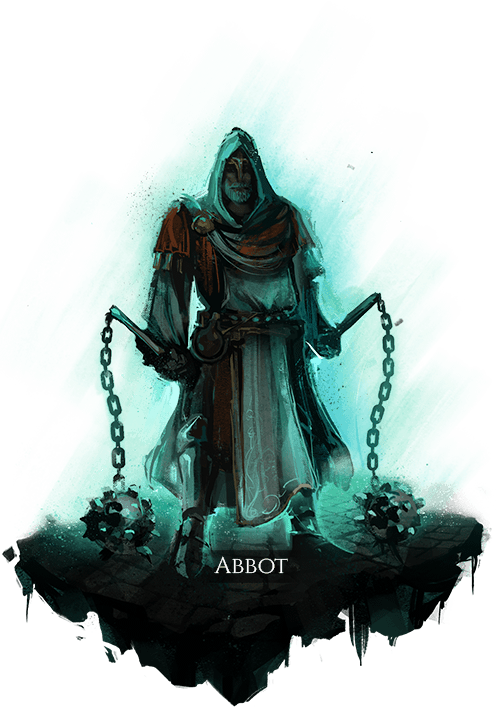 In a world without Veilstorms, Abbots would spend lives removed from the world, looking after their religious charges. In our world, they spend decades in cloisters, studying and honing their magical and physical abilities, as well as their personal recipe for nature’s greatest gift: beer. Once they reach the pinnacle of raw power within their respective religious orders, they become worthy to enter the world to fight for their Realm. Abbots have a fondness for intoxicating beverages, especially those from their own order, and most importantly, for beer. Disallows the use of heavy armor. Disallows the use of slashing and piercing weapons. Gains increased damage and healing based on the number of nearby group members, which is temporarily lost in the event of a group member’s death. Consuming alcohol increases movement speed and reduces ability preparation and recovery times for a brief duration, which is extended when dealing damage to enemies. Deals a high amount of radiant damage to the target, and leaves light briefly lingering in the area. or if applied multiple times, applies a stronger Reaction with the same effect, up to a limited amount. A deceptively powerful melee weapon, which strikes quickly and deals crushing damage along with high disruption damage. A channeling ability which reduces panic rating and heals nearby allies over time, by an amount divided by the number of allies present. The user explodes in a fountain of beer, applying an Impairment to nearby enemies which reduces their movement speed, and reduces their vision by a progressively fading amount based on the user’s remaining blood.